Emptied, clean soda cans be used to create small wind turbines that spin in an outdoor breeze. Recycling aluminum in this way can demonstrate resourcefulness, as it uses materials that might otherwise be disposed of in a landfill. Children tend to enjoy simple, green projects that use common household items like cans. 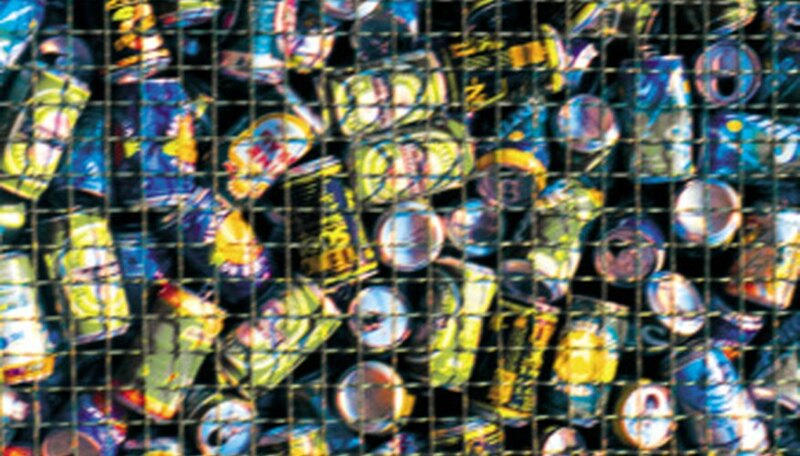 In anticipation of the project, they can start a collection of their favorite soda cans to use for the wind turbine. Rinse the soda cans and place them upside down on a flat surface. Let them dry for at least five minutes. Put on the leather gloves. Using the scissors, cut the entire top off of each can. All of the cans should be cut to approximately the same height. Draw nine lines down the length of two soda cans. The lines should be parallel and about an inch apart. Cut the two cans along the drawn lines. Leave an inch allowance at the bottom of the can. Push the strips of can made by the cuts so that they lay flat with the bottom of the can. Using the scissors, cut small incisions toward the center of the strips to make them easier to manipulate. Put on the safety goggles. Drill a small hole in the bottom of each can using the drill. Twist the strips with the needle-nose pliers so that they look like the arms on a wind turbine. All of the arms should be facing the same way. Straighten out the metal coat hanger. Do not straighten the very ends of the hanger, however; the hook and opposite corner should remain intact. Push the wire through the cans. First, string a can with no arms cut; the bottom should be facing the corner of the hanger (not the hook). Next, string a can that has arms. String the next two cans in the same pattern. Be sure to string the last can so that its arms face the same direction as the second can. Secure each can with a piece of duct tape to the wire hanger. Manipulate the position of the arms so that the they can spin unhindered. Find a breezy location outside to place the wind turbine. Use the leather gloves throughout the whole project to protect your hands from the sharp edges of the soda cans.